Reliance chairman Mukesh Ambani announced JioPhone TV cable feature at his 40th company annual general meeting on Friday 21th July. He said, our young Jio engineers have created an innovation to help a special and affordable ‘JioPhone TV cable’ that connects JioPhone with any TV, not just smart TV but even the old CRT (Cathode Ray Tube) TVs then users can enjoy viewing their Jio content on their phones from their big TV screens. First buy a device (JioPhone TV cable) which connects your phone to your TV. The device will display the content on Mobile screens on your TV set. Then you can watch any TV channel. 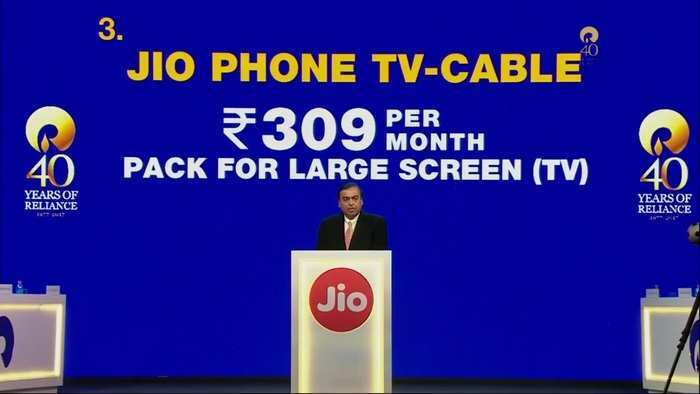 In order to broadcast their JioPhone cable on their TV, users will have to recharge with rupees 309 per month. The TV channel can be watched for 4 to 5 hours per day, as the 4G data limit of 500 MB/day.